I haven’t yet seen Secretariat, though what I’ve heard about it suggests that perhaps it will be a Netflix or pay-per-view rental, instead of a $12.75/ticket night out in New York City. The absence of Riva Ridge – in even so much as a mention – from the movie has raised the ire of a number of commentators, but I guess it would ruin the whole damsel in distress portrayal of Penny Chenery to mention the inconvenient fact that even as her magnificent 2-year-old Secretariat was winning races at a hefty clip, she was enjoying owning a Kentucky Derby and Belmont winner. And if Riva Ridge is going to get ignored, we can hardly expect that Cicada will merit so much as a glimpse. Cicada was bred by Penny Chenery’s father Christopher at his Meadow Stud. She didn’t win any Triple Crown races – though serious consideration was given to running her in the 1962 Kentucky Derby – but her record at two might even have made Big Red blush a little. Today’s running of the Grade 1 Frizette at Belmont Park offers opportunity to recall the only filly to be named a champion at two, three, and four. Among the 11 races Cicada won at 2 was the Frizette; she also had two seconds and three thirds year. She started 16 times; she hit the board 16 times. The Spinaway was Cicada’s 12th start that year; she’d already won seven races, including the Schuylerville earlier that month. After winning the Matron and the Astarita at Belmont, she added the Frizette to her 2-year-old résumé, finishing off 1961 with a 10-length win in the Gardenia at Garden State. She had earned more money than any 2-year-old filly in history, and she was that year’s champion. At 3, Cicada raced 17 times, notching eight wins, including the Kentucky Oaks, the Acorn, the Mother Goose, and the Beldame; she lost the Florida Derby by a nose to Ridan. At 4, she won the Sheepshead Bay, the Vagrancy, and the Distaff. These campaigns added two more championships to her list of impressive accomplishments. By 1971, Chenery had another 2-year-old champion in Riva Ridge, but his health had so deteriorated that he was living in a nursing home. Writes Bowen, “Tears were said to have rolled down his cheeks when a nurse told him of Riva Ridge’s victory in the 1972 Kentucky Derby.” By the next year, he was reportedly so ill that he was unable to enjoy Secretariat’s season for the ages. Of [Chenery’s] forty-three stakes winners, five (12 percent) were champions, of which two were Horse of the Year. Three of them won a total of six Triple Crown races. Four are in the Hall of Fame (Hill Prince, Cicada, Riva Ridge, Secretariat). Three of Chenery’s mares were Broodmares of the Year (Hildene, Iberia, Somethingroyal). Not quite fitting into any of these categories was sir Gaylord, a sire of international consequence. During Chenery’s illness, daughter Penny stepped in to manage the family’s racing operations, and in fact, racing historians note that it was she, more than her father, who was responsible for Secretariat’s breeding. It is she who will be forever linked to the 1973 Triple Crown winner, she who takes center stage in the movie about Secretariat’s life, she who needs rescuing from a terrible fate by the super-horse who comes to save the day. That rumbling? It’s Mr. Chenery, Cicada, and Riva Ridge, turning in their graves. Click here for another BB post about this terrific filly, and thanks, NYRA, for this video about her. The Times articles may require a subscription or payment. Photo of Cicada from her page at the National Museum of Racing and Hall of Fame. Bowen, Edward L. Legacies of the Turf: A Century of Thoroughbred Breeders (Vol. 2). Lexington, Kentucky: Eclipse Press, 2004. Nichols, Joseph C. “Cicada Captures Frizette; Triumph 10th in 15 Starts.” New York Times, October 8, 1961. Nichols, Joseph C. “Cicada, Under Bold Ride by Valenzuela, Wins $80,700 Spinaway at Saratoga.” New York Times, August 24, 1961. Great post , Teresa ! I remember as a child looking up the word “Cicada” and finding it to mean “little bug”, so I always wondered about Cicada’s size. Hard to tell, by your pix, as the groom looks like a big guy, but interesting nonetheless. It’s so interesting to see the old programs too. Right off the bat, I see Bramalea, mother of Roberto! And about the movie, tho I haven’t seen it yet, either, I guess there’s just so much you can fit into one film, but more background would have been nice, especially for racing fans. It’s a good movie. It’s not historically accurate but most movies, let’s face it, aren’t. The purist in me was thrilled that as Secretariat crossed the Belmont finish line in the movie a good 2/3rd’s of the crowd applauded heartily. There are many degrees of classic separation in this post. At the time, there’d been established a filly Triple Crown in NY and Cicada won two legs, while Bramalea won the CCA Oaks. As Susan, above, pointed out, Bramalea produced 1972 US-bred Epsom Derby winner Roberto (by Hail to Reason, by Turn-To). Cicada’s colt stablemate was the same-age Sir Gaylord (by Turn-To), the favorite for the 1962 Kentucky Derby who was unable to run after injuring himself on the eve of race. 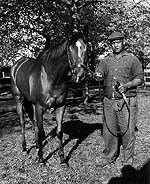 Sir Gaylord was Secretariat’s half-brother, and like Bramalea, he, too, got an Epsom Derby winner: His US-bred son Sir Ivor won in 1968. Cicada was produced by the mare Satsuma, a daughter of Meadow Stud’s foundation mare Hildene. The latter, when bred to the ubiquitous (in this comment) Turn-To, produced champion First Landing for Meadow Stud. First Landing sired Meadow Stud’s 1972 Derby and Belmont winner Riva Ridge. Meanwhile, Sir Gaylord’s dam produced Secretariat, the 1973 Triple Crown winner. Cicada herself wasn’t a distinguished producer, but her lone stakes winner from six live foals was Cicada’s Pride, a son of Sir Gaylord. First landing’s son Riva Ridge didn’t win the Preakness, but First Landing’s half-brother by Princequillo, Hill Prince, did. Susan, I read about her size last night, but I can’t remember the details. I’ll check later and let you know. I love that program you have here Teresa. You know I do love these remembrances of horses of yesteryear. Re. Movie: There is a video interview with Penny Chenery by Lenny Shulman which is still on Bloodhorse and Penny explains why Riva was left out & other thoughts on the direction the movie takes. Brian wrote a good review & I think the whole idea is to make a film about a legendary horse that will appeal to a huge crossection of people. It’s an entertainment movie meant to introduce people to racing & the fun it can be, and hope that they will learn about horses & come racing more often. 37 yrs. is a long time to get a movie done about Secretariat and I feel that as many of us “insiders” as possible should go and help it be successful, even if we don’t like the “Disney” aspect. They were brave enough to take on the project. Racing needs all the help it can get & Ihope this film will make a good impression with the general public. I have a Hildene mare top and bottom. She just foaled and I am very happy with her. It bothers me that Riva is left out, but maybe it is possible that all the details may have confused the audience given budget and length of film. At least the film is getting good reviews and maybe will lead to another. Perhaps a American Experience on horse racing, PBS, would give the detail and honesty that is missing from a big Hollywood production. I do not think Disney is at fault as much as the screenwriter and director who told a story well and seem to have a smash on their hands. Good Luck to all concerned and may it help the sport we all love. Penny Chenery herself said in an interview that bringing Riva Ridge into the story would just be too much information. I agree with Cris that PBS or American Experience could do a program similar to the Seabiscuit one which I think was American Experience. Mr. Chenery would rumble for sure if he could see the world today compared to the world as it was in his time. Cicada is the answer to one of my favorite trivia questions, i.e. what Hall of Fame horse finished last in the 1962 (Jaipur v. Ridan) Travers. Thanks, everyone! Having not seen the movie, I hesitate to say too much about it–but even if there’s not time to go into the whole story of the Chenery family, was it necessary, I wonder, to present the Secretariat story in such isolation? Guess I’ll have to see it and find out. Excellent trivia, Allen! When I read her pp’s, I always want her to do better in the Travers than she did. Cicada was quite small, standing just over 15.2 hands at the end of her 3yo season, per the measurement of Dr. Gilman. She did, however, have a substantial girth (73 inches) and was tough as a walnut. The champion filly at 2, 3, and 4 made 16, 17, and 8 starts in those seasons. She was quite a filly. Frank, thanks for that information. I forgot to look, as I’d said that I would. So perhaps she was indeed a “little bug,” Susan. I found I enjoyed the movie more when I started viewing it as being about a woman learning how to make her place in the world and saving the family farm who just happened to own a horse named Secretariat. It’s really Penny’s story. ETA: History fan that you are, you would enjoy “Secretariat’s Meadow”. A moment of silence for the great Pleasant Tap who has succumbed to laminitis. I visited him in and his dad when they were living together in retirement back in 1996. All he ever asked for was a carrot and some mud to roll around in. Cicada was one of my first “favorite” fillies in racing. She indeed was small, but swift, and a tough cookie. I also count her stablemate, Sir Gaylord, as among the first stakes horses whose name I came to know well as a young, neophyte racing fan. Along with Kelso, Beau Purple, Jaipur, Ridan, and, later, Chateaugay, Affectionately and Buckpasser, they were the stars to follow in the 1960s. I wish that I’d been able to see her, Leslie–I’m envious. She’s one of my favorites.